The story of the dedication of Nehemiah's wall, in Nehemiah chapter 12, describes the princes of Judah walking "upon the wall". 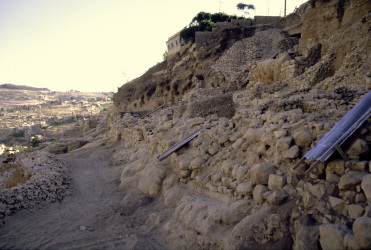 Area D2 in the City of David contains a remnant of Hezekiah's mid-slope wall with a Persian period (time of Ezra and Nehemiah) walkway preserved on top (Yigal Shiloh, Excavations At The City Of David I, Qedem 19, 1984, p. 9). In light of Nehemiah 12:31 and 38, this qualifies Hezekiah's wall as the best candidate for the wall that was "repaired" by Nehemiah (Nehemiah Chapter 3). The Jerusalem that King David conquered from the Jebusites covered only about 12 acres and was defined on three sides by high ridges and deep valleys. The Jebusites had built a massive wall on the vulnerable north side of the city. King David’s son, Solomon, enlarged the city northward to include the area of the Temple Mount. Jerusalem then covered about 32 acres which was still defined on its eastern side by the Kidron Valley. King Hezekiah later expanded the city westward to accommodate its growing population. The entire city then consisted of about 135 acres. When the Assyrians threatened to attack in 701 B.C., Hezekiah built a wall and repaired sections of the original, Jebusite, wall on the eastern side of the city that had been constructed between the top of the ridge and the bottom of the valley (the mid-slope wall). Hezekiah’s wall was very strong, being five meters (16.4 ft.) wide entirely around the city. Archaeologists have uncovered large portions of it that have survived to this day (Benjamin Mazar, The Mountain of the Lord, 1975, pp. 176, 177; Yigal Shiloh, Excavations At The City Of David I, Qedem 19, 1984, p. 29). It was this wall with its gates that Nehemiah repaired after his return from Babylon. King Cyrus captured Babylon in 539 B.C. and by 536 B.C., exactly 70 years after they were taken captive, the Jews were allowed to return to rebuild Jerusalem and the Temple. In 458 B.C. Ezra brought another group of captives to Jerusalem and in 445 B.C. the final expedition of Jews came to Jerusalem under the leadership of Nehemiah. Artaxerxes agreed to send Nehemiah to Jerusalem, appointed him as Civil Governor for 12 years, and authorized him to complete the rebuilding of the wall (and gates) of the city, a task that took him but 52 days to accomplish ( Neh. 6:15). In Nehemiah 3:25 it says, "Palal the son of Uzai, over against the turning of the wall, and the tower which lieth out from the king's high house, that was by the court of the prison..." The court of the prison was located within the palace (Jeremiah 32:2) so the "tower that lieth out" may have been adjacent to the palace. 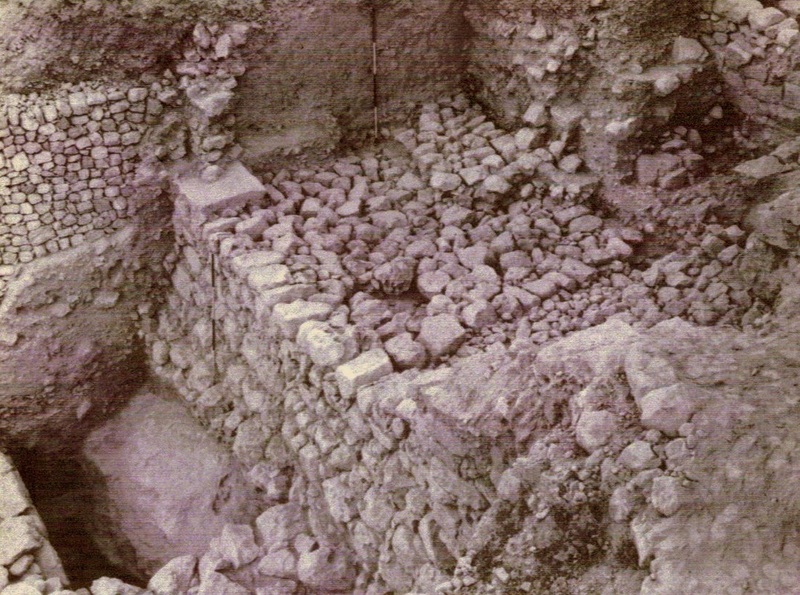 The Stepped-Stone Structure supported part of the palace area above the Gihon Spring (Amihai Mazar, The Search for David and Solomon: An Archaeological Perspective, The Quest for the Historical Israel, 2007, pp. 125-127) and there are remains of a tower on its northeastern side. 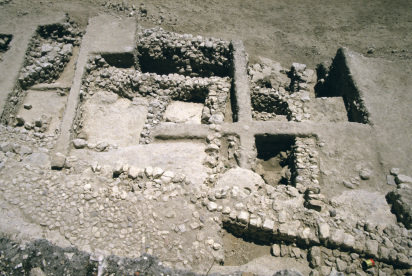 Archaeologist Eilat Mazar has found dog burials and Persian period pottery beneath the tower (Eilat Mazar, The Wall That Nehemiah Built, Biblical Archaeology Review, Mar/Apr 2009, pp. 24-28, 30-33, 66) which dates its construction to around the time of the return from captivity. There is some disagreement among scholars as to the location of the section of wall and gates that Nehemiah rebuilt on the eastern side of the City of David. Did Nehemiah erect a wall on bedrock along the top of the ridge or did he repair Hezekiah's mid-slope wall with it's gates? Consider these reasons for accepting the latter view for the location of Nehemiah’s wall in the City of David. The First Reason: The word repaired The first and probably the most compelling reason to believe that Nehemiah did not build a new wall on top of the eastern slope is because of the narration in Nehemiah chapter three. Nowhere does it mention the building of a new wall. It says, 35 times (7 x 5), that he repaired the wall. 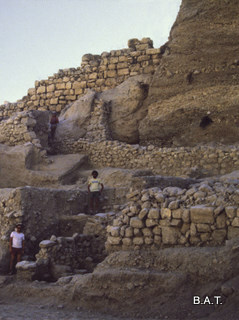 Dame Kathleen Kenyon argued that Nehemiah built a new wall on the eastern ridge and abandoned Hezekiah’s mid-slope wall. One of her reasons for this argument was that Nehemiah 4:10 says: there is much rubbish; so that we are not able to build the wall. Nehemiah 4:10 is not the end of the story, however. Nehemiah 4:15 tells us that the work of rebuilding Hezekiah’s broken wall continued and was not abandoned: …we returned all of us to the wall, every one unto his work. Nehemiah’s predecessor, Hezekiah, built his wall on the ruins of the old Jebusite wall, not on the top of the ridge. 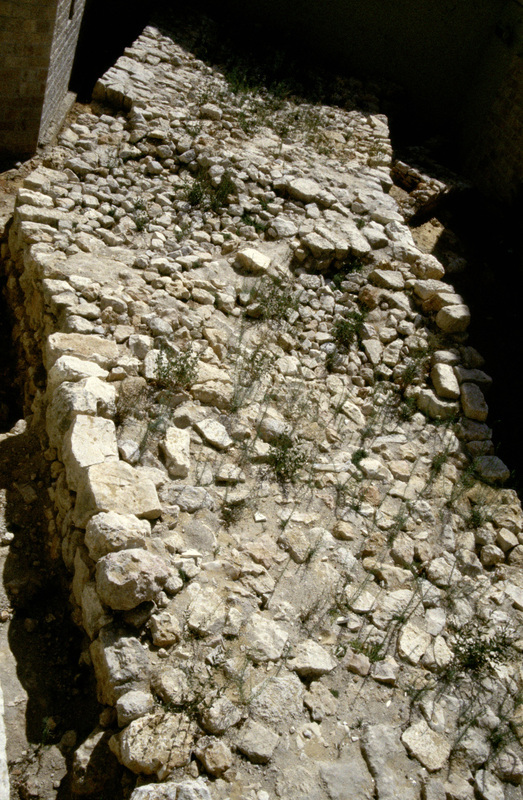 The only wall, therefore, for Nehemiah to repair was Hezekiah’s mid-slope wall. When Dr. Yigal Shiloh began the City of David excavations in 1978 he followed the assumption of Dame Kenyon that Nehemiah’s wall was on top of the eastern ridge of the City of David. He was surprised then to find that in his excavations of Hezekiah’s mid-slope wall, “the pottery of Stratum 9 (Persian, Nehemiah’s time) was scattered throughout most of the excavational areas.” Dr. Shiloh’s confusion became apparent when he continued: “It is presently impossible to define more precisely the nature of this stratum, located on the eastern slope of the City of David, outside the new line of fortifications - which in the accepted opinion, was built in this period on the bedrock at the top of the eastern slope.” (Yigal Shiloh, Excavations at the City of David I, Qedem 19, 1984, p. 29). Dr. Shiloh could not understand why artifacts of Nehemiah’s Persian period were found along the inside of Hezekiah’s mid-slope wall. The answer is that Nehemiah did not build on top of the ridge but repaired Hezekiah’s mid-slope wall. Neatly tucked away in the eastern slope of the City of David is the entrance to the ancient Jebusite passageway leading to the Gihon Spring. It was through this passageway that Joab was able to enter the city behind the Jebusite mid-slope wall and conquer Jebus, thus becoming the general of King David’s Army. There are many locations of Biblical events that are difficult to pinpoint but this is not one of them. On July 26, 1984, after excavating along Hezekiah’s wall all morning, Dr. Shiloh decided to unlock the gate and take our whole group of volunteers through the passageway, down toward the waters of the Gihon Spring. Now the critical question arises. Where is this entrance of the passageway to the water supply found? It is located above the Gihon Spring just above the ancient Jebusite water gate. It is behind the Jebusite mid-slope wall and in front of any wall that would have been built on top of the eastern ridge. During the time of Nehemiah, the Jebusite passageway was still in use. Jerusalem’s aqueduct was not constructed until much later, at the time of Herod the Great. It would make absolutely no sense to build a wall above the entrance to the water source. It would then be out of range for the people of the city but completely accessible to the enemy. In 1912-14 Raymond Weill excavated along the southeast side of the City of David. Near the Tombs of the Kings he observed a large wall (actually two parallel walls adjacent to each other) aligned with the top of the eastern ridge of the city. Obviously he thought that this might be a section of Nehemiah’s famous wall for he describes it as being "built by sections entrusted to different teams and built in a hurry." A careful examination, however, shows that this may not be true. 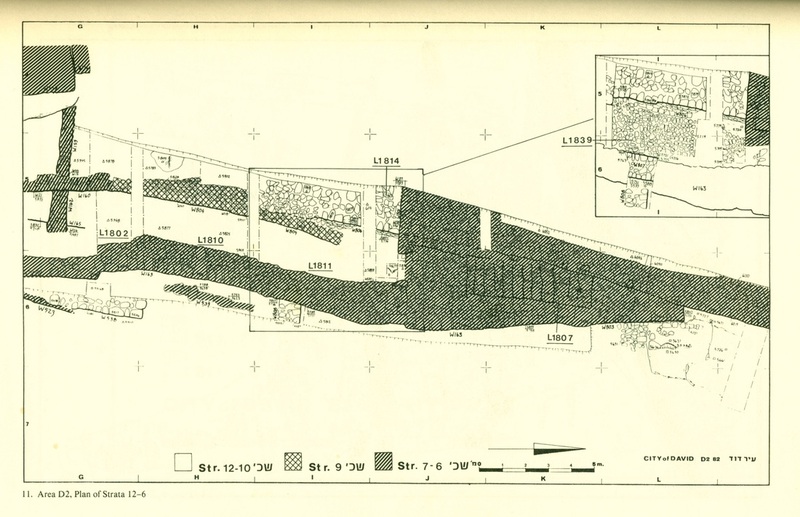 Today we know these same walls as W151 and W152 in Area D1 of Dr. Shiloh’s excavations (Yigal Shiloh, Excavations at the City of David I, Qedem 19, 1984, p. 7, 8). They are built on bedrock and on a layer of white, chalky, limestone chips from a nearby quarry. Dr. Shiloh dated the chips to the Persian period (6th- 4th centuries BCE, the time of Zerubbabel and Nehemiah). It is possible that the chips are the result of quarrying by Zerubbabel when he needed ashlars for the rebuilding of the Jewish Temple. The walls couldn’t be the work of Nehemiah because we have already proved that Nehemiah did not build a new wall on the ridge but rebuilt Hezekiah’s mid-slope wall. It couldn’t be the later work of the Hasmoneans because they were famous for their large rectangular ashlars with smooth margins and a prominent boss. Examples of these stones are found at the eastern Temple retaining wall near the East Gate. They are also found along the southern wall of the city, between the Valley and Dung Gates and in the construction of the wall that abuts Hezekiah’s Tower near the Broad Wall in the western city of Jerusalem. The reason that the Hasmonean ashlars are so superior to those in Hezekiah’s/Nehemiah’s walls and Walls 151 and 152 is because in 152 B.C., King Demetrius of Syria made a treaty with Jonathan the Maccabean in which he agreed to pay for all expenses for repairs to the Temple Mount and the walls of Jerusalem. The historian, Josephus, records the words of Demetrius: “I also give you leave to repair and rebuild your temple, and that all be done at my expense. I also allow you to build the walls of your city, and to erect high towers…at my expense.” Walls 151 and 152 at the southeastern end of the City of David contain none of the ashlars that characterize the work of the Hasmoneans. The walls and tower, along the top of the ridge, must have been constructed earlier. Professor Macalister, Crowfoot, Dame Kenyon and Dr. Shiloh have discovered large amounts of Hellenistic potsherds and artifacts in the City of David. The tremendous amount of Greek stamped handles from broken Rhodian storage jars (amphora) found in the City of David attest to the density of the Hellenistic population of that part of the city during the Hellenistic period (Donald T. Ariel, Excavations at the City of David II, Qedem 30, 1990, pp.13-16). One day, while digging near the round tower in Area D-2, a volunteer cried out, “Inscription!” We all gathered around to witness the identification of the stamped Rhodian amphorae handle. More of these handles have been found in the City of David than in any other part of Jerusalem. More than 1,000 were found in the City of David compared to about 138 in all the rest of Jerusalem. Many other artifacts including an image of the Greek god Zeus were also found there. Following northward along the top of the ridge from walls 151 and 152, described by Weill, we come to the massive Stepped Stone Structure with a tower attached on each side. Dr. Eilat Mazar recently dismantled the northern tower and found a layer (nearly 5 feet deep) of Persian period artifacts . Underneath the thick layer of Persian period pottery, Mazar found many Babylonian period artifacts. 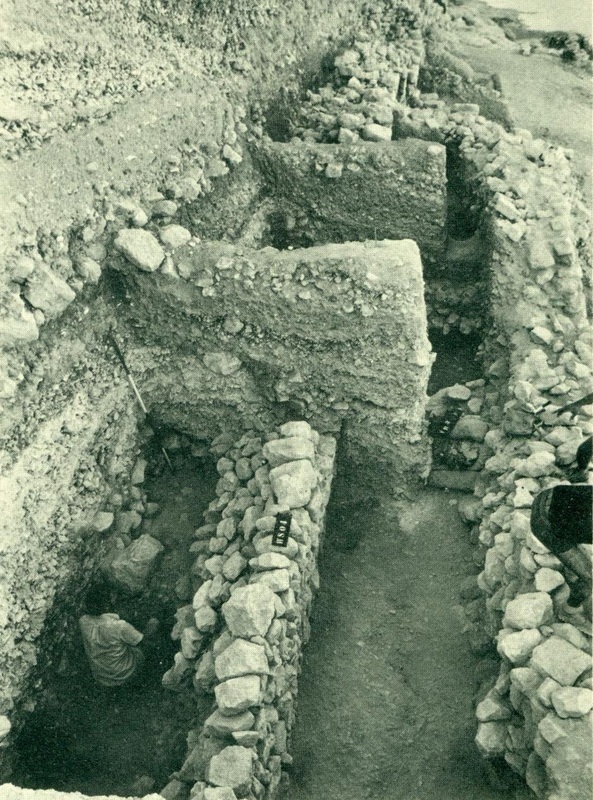 More importantly, she found two dog burials on top of the Persian period strata directly under the tower (Eilat Mazar, The Wall That Nehemiah Built, Biblical Archaeology Review, Mar/Apr 2009, pp.24-28, 30-33, 66). Recent excavations in Ashkelon have produced the same thick layer of Persian period pottery complete with dog burials on top. When the Stepped Stone Structure and towers were first discovered they were covered by a thick glacis from the Hellenistic period which made assent to the eastern slope very difficult. The existence of this glacis, covering the Base of the Stepped-Stone Structure and towers, proves that they were constructed during, or earlier than, the Hellenistic period. The eastern slope of the City of David had a protective wall that had been constructed by the Canaanites in the Middle Bronze Age II. This wall ran from south to north along the middle of the slope. King Hezekiah repaired that same wall in the Iron Age (II Chronicles 32:5) "Also he strengthened himself, and built up all the wall that was broken, and raised it up to the towers, and another wall without." 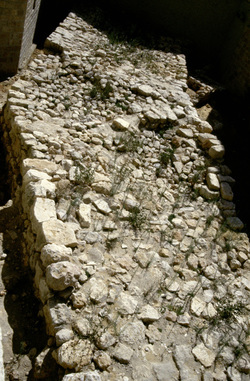 This outer wall has been found at the bottom of the slope by Ronny Reich and Eli Shukron (Ronny Reich, Excavating the City of David, 2011, pp. 179-181), and is positively dated to the time of Hezekiah's reign. Nehemiah repaired Hezekiah's mid-slope wall around 445 B.C. because it was still the best location for a wall to protect the city. There are three walls in this picture of Areas D1 and D2 near the southern end of the City of David. Just behind the wall in the middle, may be the remains of Nehemiah's repair of the earlier mid-slope wall (W. 804) as it runs into bedrock here in the south (see photo below). The wall on the upper ridge was dated to the Hellenistic period after Yigal Shiloh found white, limestone, chips from a Persian period quarry beneath it. The wall in the foreground is of similar construction and is also dated to the Hellenistic period by the pottery associated with it. The upper-ridge wall continued northward to the older Stepped-Stone Structure. The glacis that once covered the Stepped-Stone Structure also dated to the Hellenistic period. The mid-slope wall was originally built on this natural bedrock shelf by the Jebusites. It runs southward, in this picture, where it finally meets an outcropping of bedrock near the top of the ridge in Area D1. King Hezekiah repaired this section of the Jebusite wall when the Assyrians were planning to attack Jerusalem (II Chronicles 32:5). The Babylonians later breached the wall and burned it's gates. 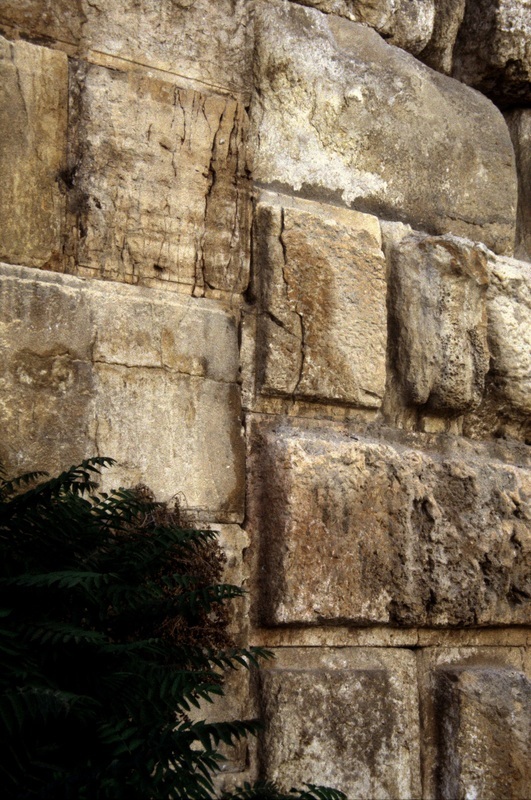 Seventy years later, Nehemiah returned and repaired this same wall and gates, including the Fountain Gate, to the south, and the Water Gate near the Gihon Spring, to the north. King Herod extended the Temple Mount platform to the south. The stones on the left in this picture belong to the time of Herod and the stones on the right belong to the time of the Hasmoneans or earlier.